The four photographs show parts of the West Campus Dedication celebration. Dr. C.F. Menninger and his sons, Dr. Karl and Dr. Will, formed a group psychiatry practice in 1919. The Menninger Clinic as a sanitarium was established in 1925 with the purchase of a farm house and admittance of 12 patients. The philosophy was that mental illness could be treated with an integrated medical, psychodynamic, and developmental approach for the total health of patients. The Menninger Clinic's facility was expanded in the late 1970's to be a residential scale community of 28 structures on a 350 acre hilltop campus. 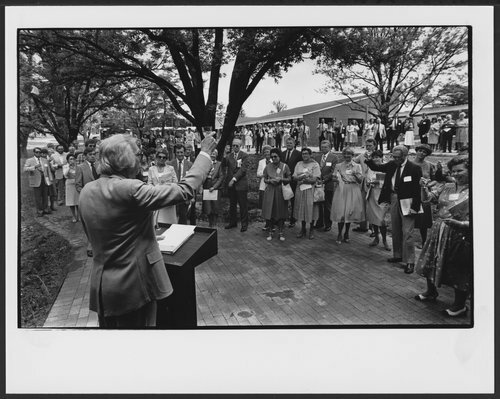 Menninger Clinic West Campus Dedication in Topeka Kansas - This photograph shows Dr. Roy in front of the dining hall addressing trustees and employees.